A hat-trick to talisman Paul Ifill was not enough for Tasman United to secure their first home win of the season against Hamilton Wanderers in the ISPS Handa Premiership. The Davor Tavich coached side, who were looking to stay in touch with the top four, were held by 10th-placed Wanderers to a 4-4 draw when Alexis Varela scored a dramatic equaliser from a free kick in the 89th minute. It was another disappointing result for Tasman United who now slip to sixth on the ladder, three points back from Canterbury United who are in fourth place. There were penalties aplenty in the fixture with Ifill scoring two and Armin Pasagic also converting two from the spot for Wanderers in a dramatic match. Tasman, who joined the ISPS Handa Premiership last season, have seven games left in the regular season to keep their playoff chances alive. Meanwhile up in Auckland, Waitakere United and Canterbury United Dragons played out a 1-1 draw at Trusts Arena. The Dragons, who came into the fixture winning five of their last six games, went ahead in the 31st minute when the five-time champions conceded an own goal. The Chris Milicich coached side came back into the match and striker Godwin Darkwa scored on the end of a ball in from the left from Keegan Linderboom to level the score. Linderboom had a chance late in the match to claim all three points when he went one on one with Dragons keeper Coey Turipa but he was unable to convert. The draw sees Canterbury United remain in fourth place, one point back from Auckland City in third and one ahead of Waitakere United in fifth place. 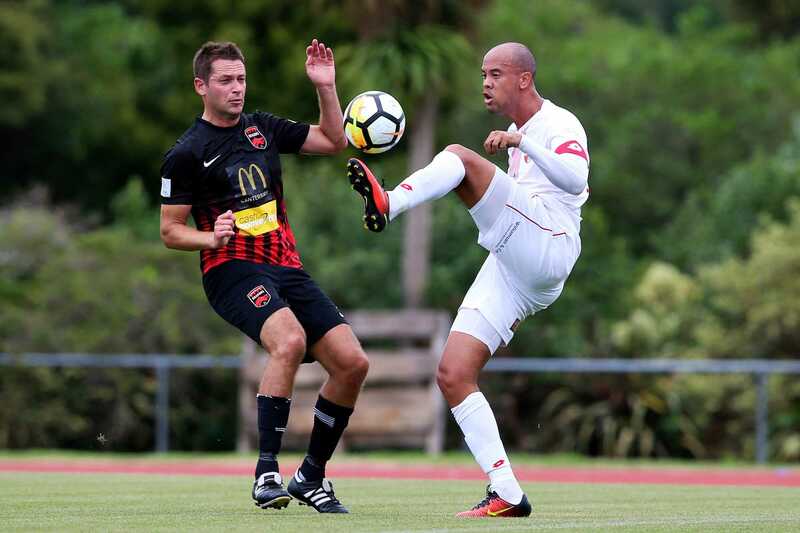 On Saturday, Eastern Suburbs went joint top of the ISPS Handa Premiership table wehen they defeated defending champions Team Wellington 2-1 this afternoon in Auckland. The Lily Whites, who have a game in hand on the league leaders Team Wellington who remain in front on goal difference, took a big step towards the playoffs when they secured their third victory in a row to draw level on 20 points. A deflected shot from Andre de Jong in injury time - which went in off Scott Hilliar and past Scott Basalaj in the Team Wellington goal – proved the difference as the home side secured an important come from behind victory. The Jose Figueira coached side had taken the lead in the 18th minute when Nathanael Hailemariam finished on the end of a long-range free kick. Shortly after half time, Suburbs forward Derek Tieku got a well-deserved equaliser with a deflected shot from the edge of the area. It got the home side back on level terms before they earned their fifth win of the season in a dramatic finish. Eastern Suburbs coach Danny Hay said his team will take huge confidence from beating the defending champions. Meanwhile across town, title rivals Auckland City were held to a 1-1 draw by Southern United at Kiwitea Street. The six-time Premiership champions, who have not lost to Southern in the last 24 fixtures, drew with the Paul O’Reilly coached side for the second time this season after the 2-2 draw in Dunedin in round one. Micah Lea’alafa opened the scoring in the 47th minute when he found a gap in a stoic Southern United defence before Benjamin Wade scored midway through the second half to share the spoils. “The score is disappointing but we played well considering we've only been back for two weeks. It was a difficult day very hot and in the second half the game got very disjointed,” said Auckland City Coach Ramon Tribulietx. In the capital, Hawke’s Bay United secured their first win since round four when they overcame the Wellington Phoenix Reserves at Westpac Stadium in a five goal thriller. The Brett Angell coached side took the lead in the 23rd minute when Birhanu Taye converted from the penalty spot and both teams came alive in the second half to produce and entertaining 45 minutes. Some poor defending at the back allowed Gavin Hoy to double the lead soon after the break before Sarpreet Singh inspired the home side back into the match. The New Zealand U-20 rep went on a searching run to set up the opening goal for the Wee Nix for Ollie Whyte and then scored another beauty of his own. Those two Phoenix goals were punctuated by a fine individual goal from Adam Thurston who hammered home in the 53rd minute. When Singh scored the Phoenix’s second the home team had the ascendancy and looked like they could score again, but Hawke’s Bay United held on for an important three points.